Armadillos, which some people describe as prehistoric-looking rats with a shell and sharp claws, are fascinating creatures. It's no wonder that John Irving featured an armadillo, albeit a stuffed one, in his novel, "A Prayer for Owen Meany," when he wanted to spark the natural imagination of two young boys. This South American native also lives as far north as Texas, Louisiana and Oklahoma, and parts of Florida, Georgia, Kansas, Alabama, Missouri, Nebraska and Colorado. Armadillos have sharp claws for a reason: they use them to dig burrows. 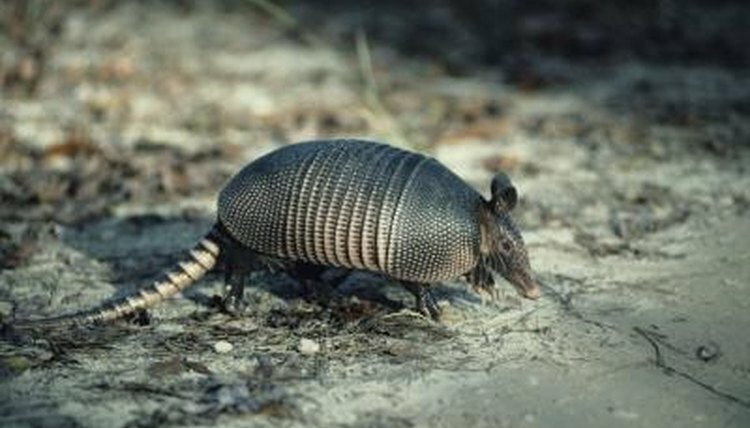 Armadillos live in the burrows they dig, and they run in the burrows to hide from predators. If something scares an armadillo, it will jump high in the air and retreat to the burrow. Armadillos are the real-estate tycoons of the mammal world, often keeping several burrows -- and each burrow can have many entrances. Armadillos spend much of their time foraging for food. They mainly feed at night but are sometimes out at other times of the day, particularly in the early morning or early evening. They mainly eat insects, which they detect by smelling or hearing them nearby. They use their long snouts to probe for the insects, which they sometimes need to dig up. They also eat some plants, although only about 10 percent or less of their diet. Female armadillos usually mate with only one male, but male armadillos usually mate with several females. Mating typically occurs during the summer. Females are pregnant for eight to nine months before giving birth. Most deliveries occur between February and May. There's no guesswork involved with how many armadillos will be born in a litter. Pregnant armadillos always have quadruplets. One egg splits to create four identical baby armadillos. The litter is all male or all female. The babies stay in the burrows until they are between 2 and 3 months old, at which time they follow their mom outside. Armadillos don't go into the water unless they have to. Their first choice when getting through a river or stream is to walk along the bottom under the water; they can hold their breath for about six minutes. If the body of water is too vast for the armadillo to get across by walking, it will swim across by inflating its stomach. The inflated stomach, which grows to twice its normal size, acts as a raft or life vest to provide buoyancy, which aids the armadillo in swimming.